Palaces, forts, temples, lakes and rich culture, Rajasthan has every ingredient required for a memorable holiday. View in Goa beaches takes every age group hearts. This package of 12 nights and 13 days offers the best of the three cities Delhi, Rajasthan and Goa. Which covers sightseeing the Major attractions to see in this city include Red Fort (world heritage site), Jama Masjid (the largest mosque in India), the City of Lakes, sightseeing tour of Old Goa visiting Se Cathedral, Basilica of Bomb Jesus and much more. Book this amzing Golden tour package with Rover holidays NOW...!! 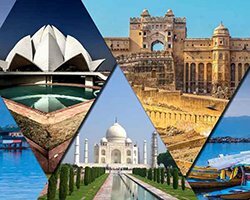 Welcome to New Delhi, the Capital City of India where you can explore with some historical, cultural, religious and heritage sites. Later proceed to the hotel Reach & check-in at the hotel and relax for a while amidst the comforts of your room. Overnight stay at the hotel. Taj Mahal en route stopping at Sikandra to see famous Akbar’s Tomb. The sanctuary is a great haven for resident and migratory birds. See the magnificent Taj Mahal at sunrise. After breakfast drive to Bharatpur in Rajasthan. Bharatpur is a much sought after destination with Keoladeo Ghana National Park formerly known as the Bharatpur Bird Sanctuary. The sanctuary is a great haven for resident and migratory birds. On arrival at Bharatpur you will be transferred to the hotel. Relax. Later enjoy birding at the sanctuary. Dinner and overnight stay will be at the hotel. Have leisurely breakfast at the hotel. Later you will be transferred to the Jaipur Railway Station to board train to Jodhpur. Our representative will receive you from Jodhpur Railway Station and transfer you to the hotel. Dinner and overnight stay will be at the hotel. Have a very hearty breakfast at hotel. Later proceed for Jodhpur sightseeing tour. Visit the magnificent Mehrangarh Fort, Umaid Bhawan Palace, and Jaswant Thada Cenotaphs. Spend the remaining day at leisure or on enjoying your individual activities. You may enjoy shopping in Jodhpur. Get back to the hotel on time for dinner and overnight stay. Take breakfast and check out from the hotel in Jodhpur. Later drive to Udaipur, the City of Lakes. On the way visit the architectural beautiful Ranakpur Jain Temples. On reaching Udaipur, check in at the hotel. In the evening, enjoy a leisurely stroll around the local bazaars of Udaipur. On time get back to the hotel for dinner and overnight stay. Have very hearty breakfast and then check out from the hotel for an exciting full day city tour of Udaipur. The key attractions you will visit include City Palace, Lake Pichola, Lake Palace, Saheliyon-ki-Bari, Jagdish Temple, and Bhartiya Lok Kala Mandal. In the evening enjoy exciting boat ride on the Lake Pichola. On time get back to the hotel for dinner and overnight stay. In the morning check out from the hotel in Udaipur. Say good bye to Rajasthan. Your next destination Goa is waiting for you. Catch flight to Goa. Our representative will receive you from Goa Airport and transfer you to the pre-booked hotel. Spend rest of the day at leisure. Dinner and overnight stay will be at the hotel in Goa.